How did I create this look? Well, gather the below items, and let’s get started! WARNING: Before getting started, please note that you will need to do this DIY in a well-ventilated area. Also, do not directly inhale any bleach fumes. Remember bleach will bleach. 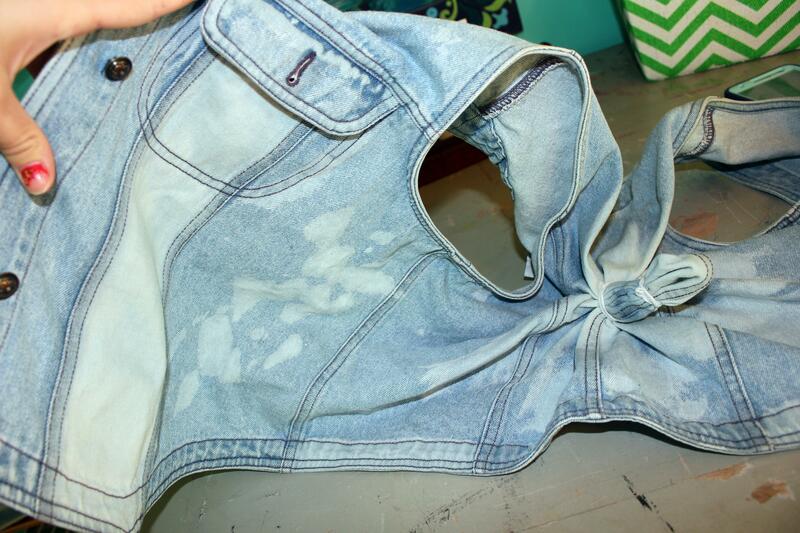 Be careful and wear old clothes! 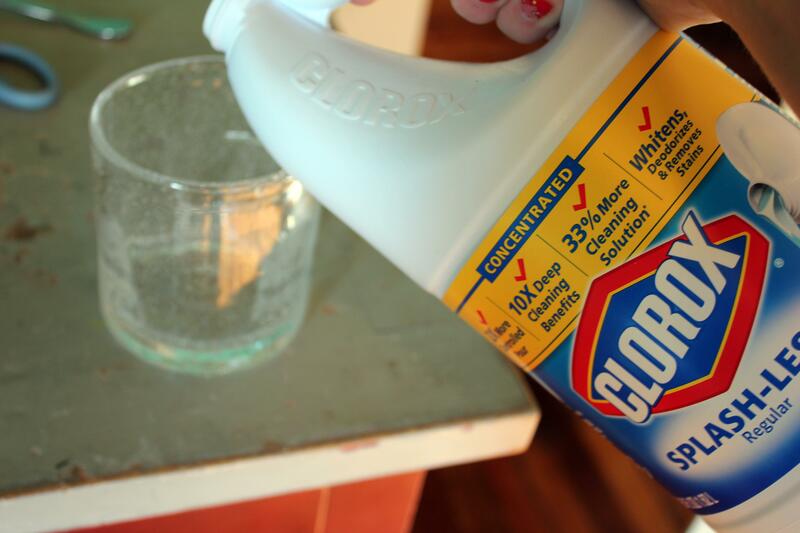 If you are sensitive to smells or bleach, do not attempt this project. 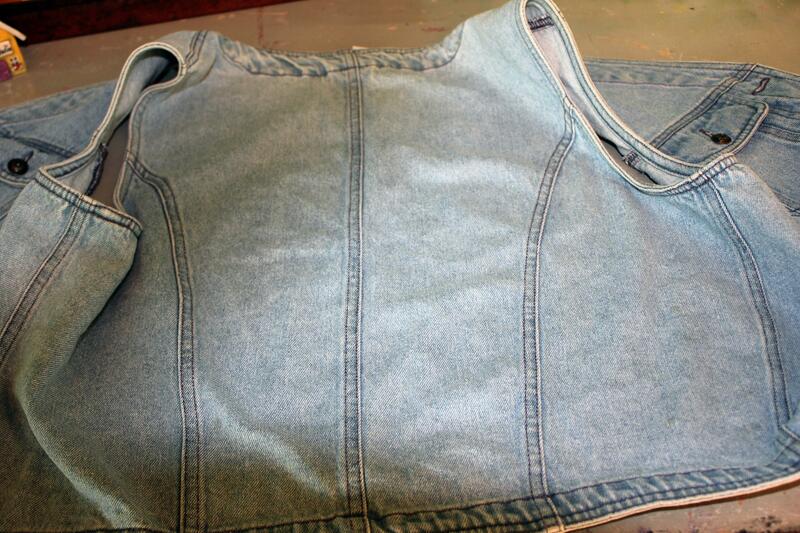 Step 1: Lay out your vest with the back panel facing up. 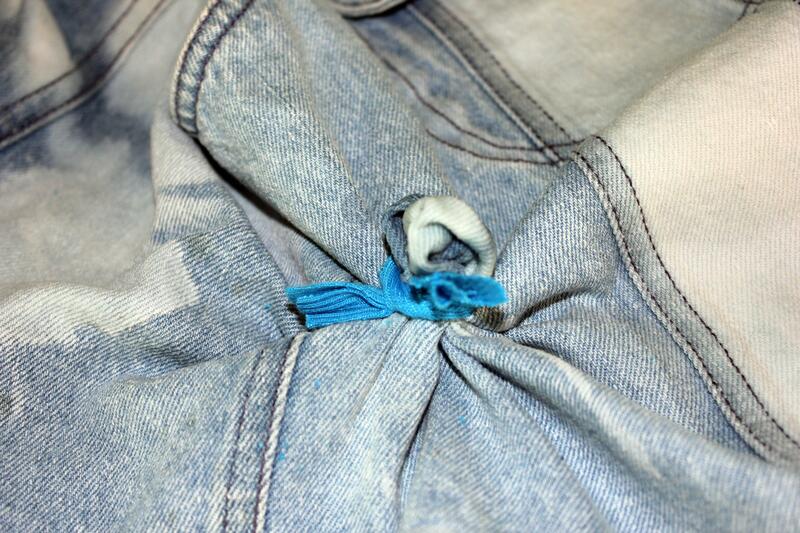 Step 2: Pinch a tiny piece of the denim pulling it up into a “unicorn horn”–this is very much like tie-dyeing–but we are going to use a bleach mixture instead of colored dyes. Step 3: Add a rubber-band or cloth tie to the bottom of your “unicorn horn”. 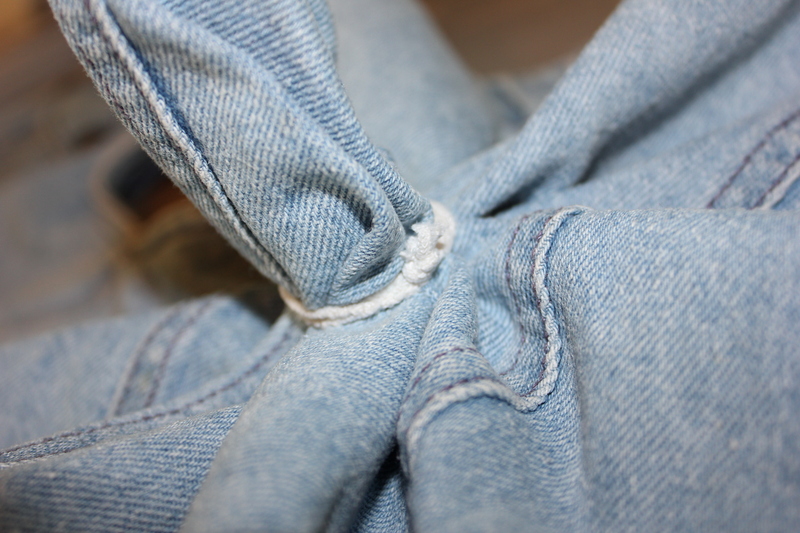 Step 4: Add another rubber-band or cloth tie about an inch from the first tie. Remember to get it as tight as possible. Step 5: Combine a half of cup of bleach with equal parts water. This is a strong mixture! Do NOT directly inhale bleach fumes. Step 6: Begin painting on the bleach-water mixture to the top of the “unicorn horn”–please be careful to not get the mixture on your hands or fingers. If you do, please stop immediately and wash your hands with soap and water. 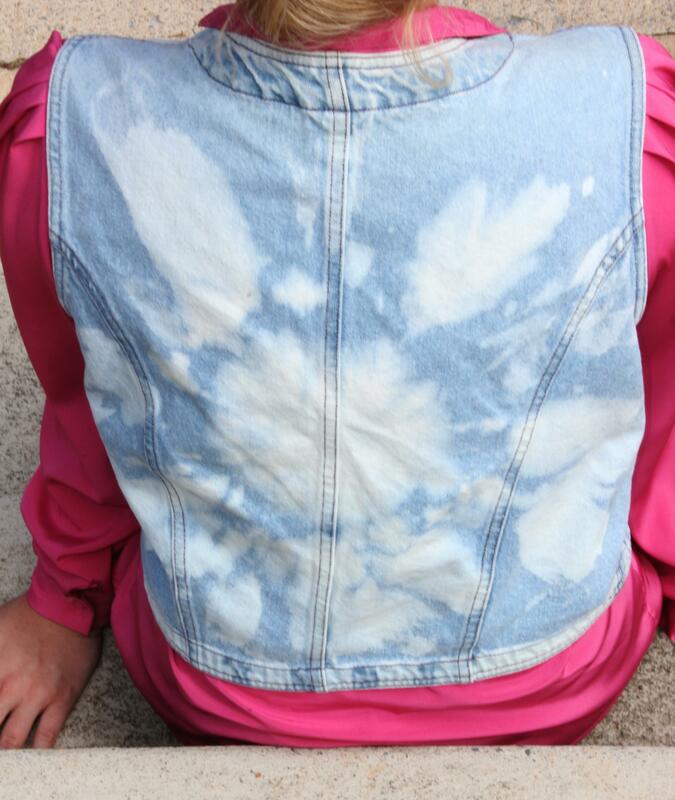 Step 7: After applying enough bleach mixture to the top, move on to the base of the vest. Do NOT “un-bunch” the vest’s base. 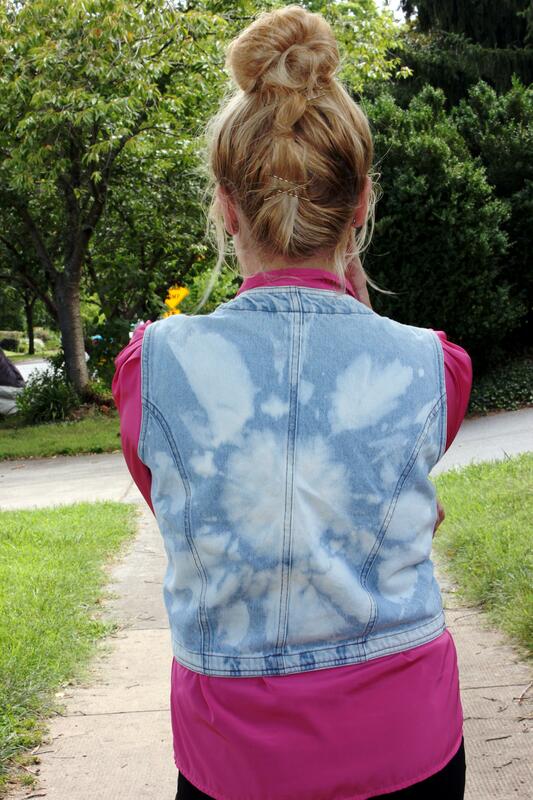 Bleaching the base while it is bunched adds a more tie-dyed effect. 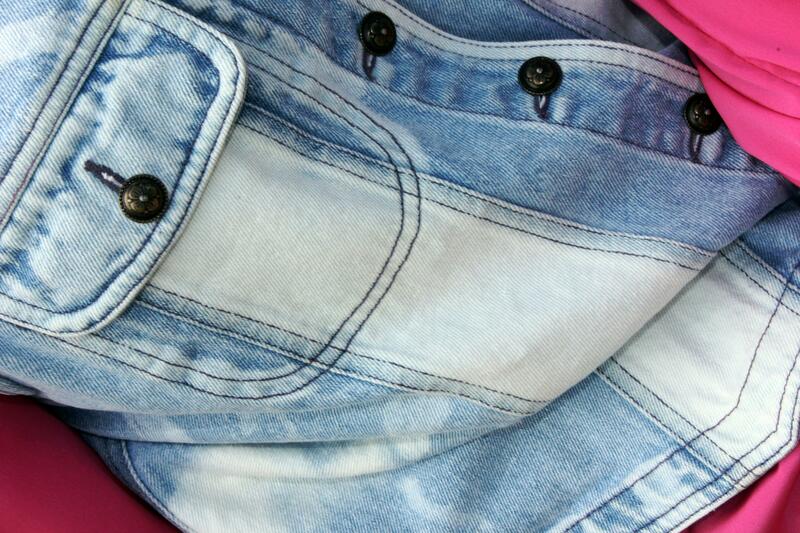 Step 8 (part 1): While your sunburst is bleaching, feel free to add mini ones in random areas on the vest. 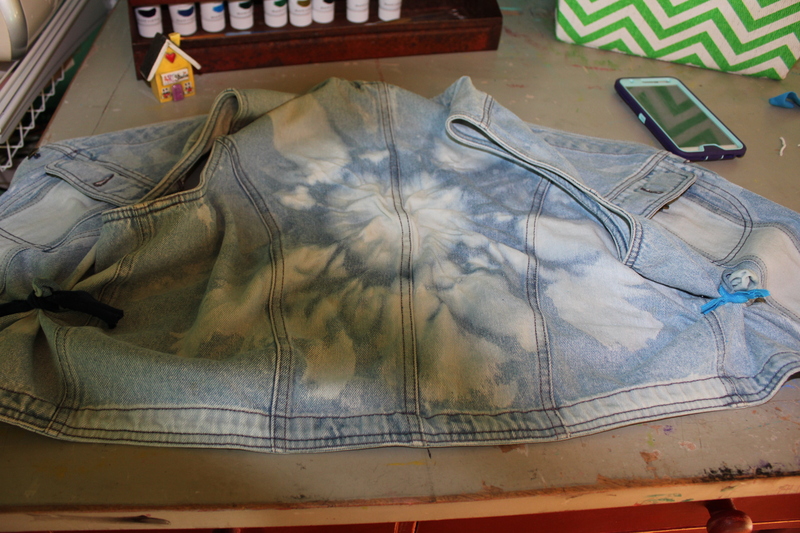 Step 8 (part 2): If desired, bleach other areas of the vest. 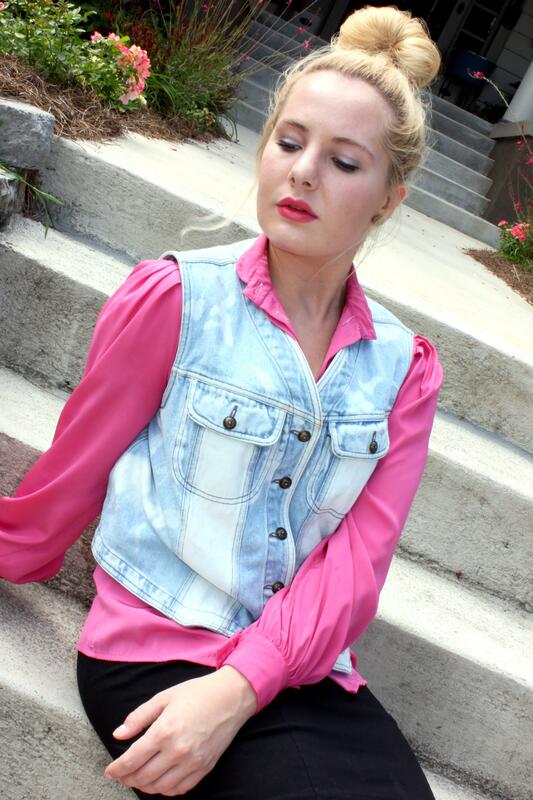 Do not be afraid to get a little creative *wink* BUT remember to be very careful! 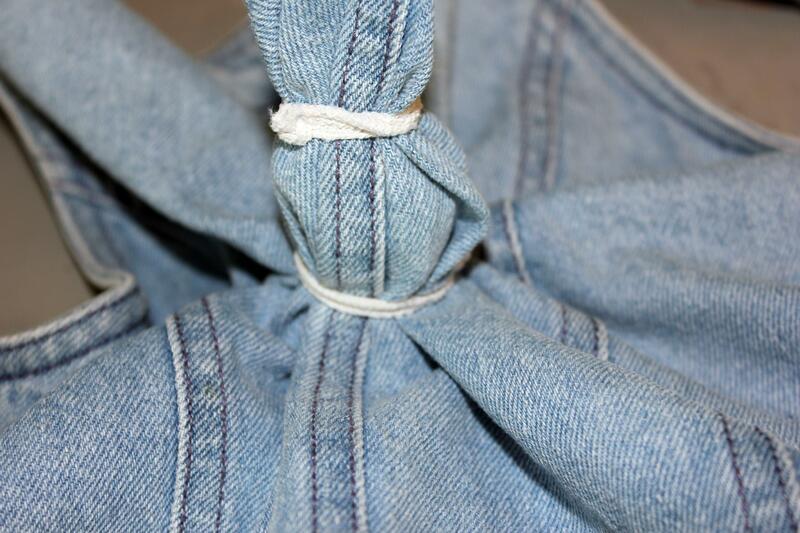 Step 9: After applying the bleach-mixture where desired, wait 7 to 10 minutes and untie the rubber-bands/cloth ties. If you have sensitive skin, please wear gloves designed for handling chemicals. 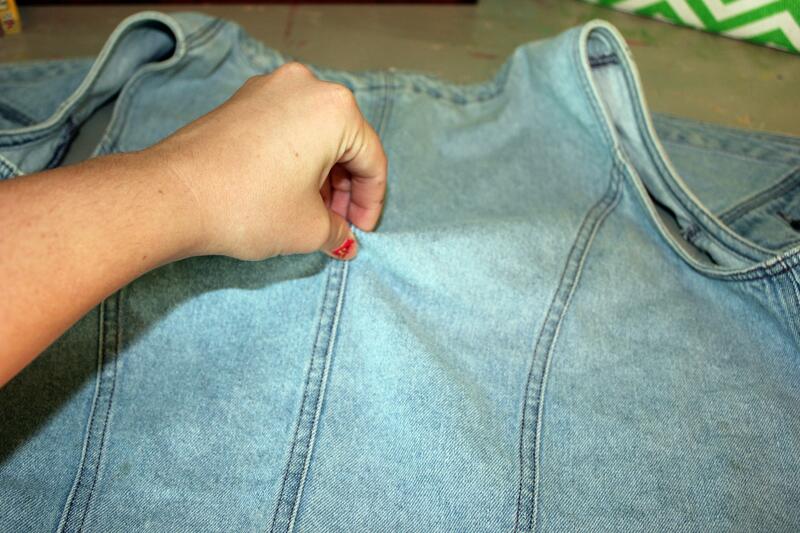 Step 10: Rinse your denim vest/jacket with warm water. 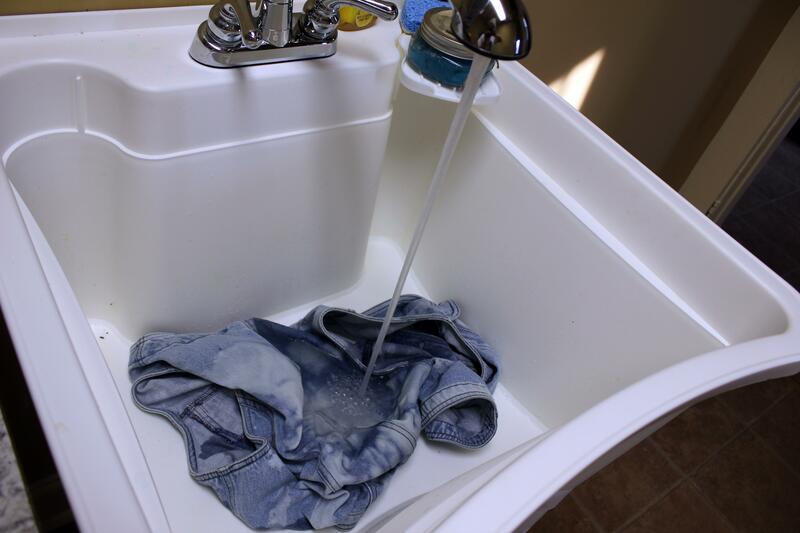 Once it is completely rinsed, throw it in the wash and hang to try. 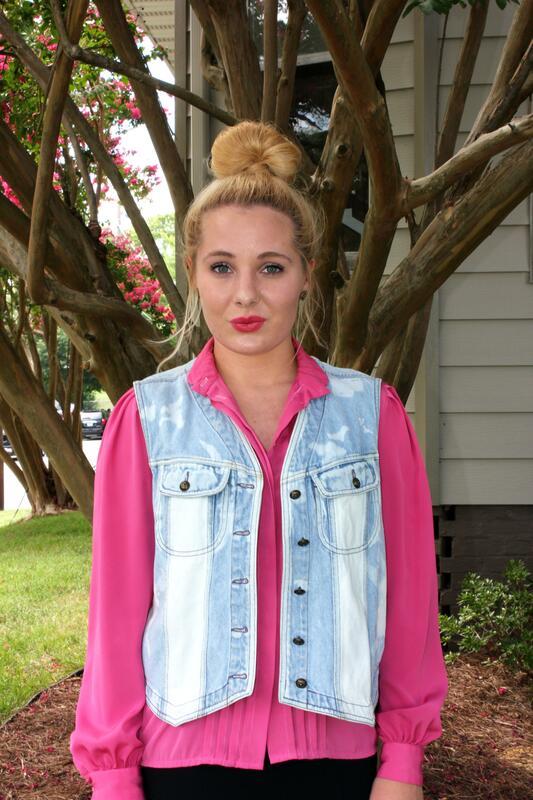 It is recommended to not wash the vest with other clothing items. Wash it alone.